When your healthcare managers and task workers are on the move inside your hospital or medical facility, the rugged Motorola MC55A0-HC mobile computer keeps everything they need to take instant action at their fingertips. Pure business on the inside and disinfectant-ready smart styling on the outside, the MC55A0-HC lets your workers access applications, scan barcodes, snap a photo, view a video and place a private or push-to-talk call to virtually anyone in your facility - all with a single device. The sleek lightweight design is not only pocketable, it is at home in front of customers and patients. And with the most rugged design in this product class, your workers get a device they can count on every day - while you get a device you can count on for years. 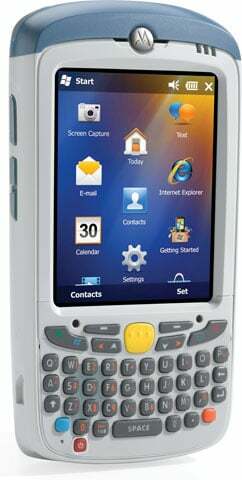 MC55A0-H80SWRQA9WR	 MC55A0-HC, Health care, Wi-Fi (802.11a/b/g), Bluetooth, 2D Imager DL, Windows Mobile 6.5, Numeric Keyboard, 256MB/1GB Flash, Extended Battery. Interface cables and charging cradle sold separately. Single slot charging cradle kit (Part# CRD5500-100UES). Four slot charging cradle kit (Part# CRD5501-401CES), requires US AC line cord (Part# 23844-00-00R). The Motorola MC55A0-H80SWRQA9WR is also known as SYM-MC55A0H80SWRQA9W	or MC55A0H80SWRQA9WR	.